Guys – I need someone to talk me down. After the epic win of my Simplicity 1609 sheath dress I felt the need to further step up my work wardrobe game. So off to Spotlight I headed and on my adventures looking for the perfect white linen I stumbled over some bizarre printed cotton. And of course I brought it home instead. Oops. So I spy with my little eye something that begins with A W E S O M E! So let’s talk about the fabric – this printed poplin is was a surprise find at Spotlight. The cool part about it is that it features gold glitter on the eyelashes. Sassy! They say that hindsight is 20:20 (bwah ha ha eye puns!) and in this case I have to agree – the poplin is a heavier weight then what is recommended and as a result it has made the Hoya very boxy. The mock wrap front panel ends up with quite a few layers and in my opinion this would hang much better with a softer weave. In saying that, the structured look is growing on me so maybe it was a happy accident? Construction wise, the instructions were clearly illustrated and in English – huzzah! No need for Google-translate this time! Constructing the mock wrap was fun – I’ve never pieced one of these together before. I like that the edges of the lapels are understitched, the same as constructing a jacket, to encourage the turn of cloth. The other interesting detail for me was the binding of the back neckline – this created a lovely polished finish. One thing to note – you will need to ease the sleevehead in. Whilst this is pretty standard it wasn’t mentioned in the instructions and I just forged ahead. Cue the seam ripper getting a good work out 🙁 Otherwise, this was a pretty chilled make and I think a confident beginner (with a stable fabric) could handle the Hoya. For the adjustments, I sewed this up pretty much straight out of the packet to see how it would perform. Due to not having enough fabric (and my nearest Spotlight being 30 minutes away to buy more) I opted to cut my hem facings out of white voile. In the end I simply overlocked the hem, folded it over and stitched up with the poor old facings relegated to the bin… Cheeky! As the poplin made this top crazy structured I decided to shape the sides a little taking 4cm off the sides at the hem and grading to nothing at the underarm seam. I also tacked the top of the wrap together as I was worried about the ole lady cargo accidentally flashing but I think it would be fine without this – I’m just a paranoid lady! The mock wrap feature. This looks super profesh! The fact Deer and Doe are doing PDF patterns. SQUEE! I utilised the copy shop print option for this top and it was instant gratification. Though what is with the price for an A0 print climbing to $4.10, Officeworks?! Broad upper back adjustment. It is nothing serious but I feel like a smidge more room would be beneficial. Nothing else. I’m rather stoked with the Hoya! Love your Hoya! 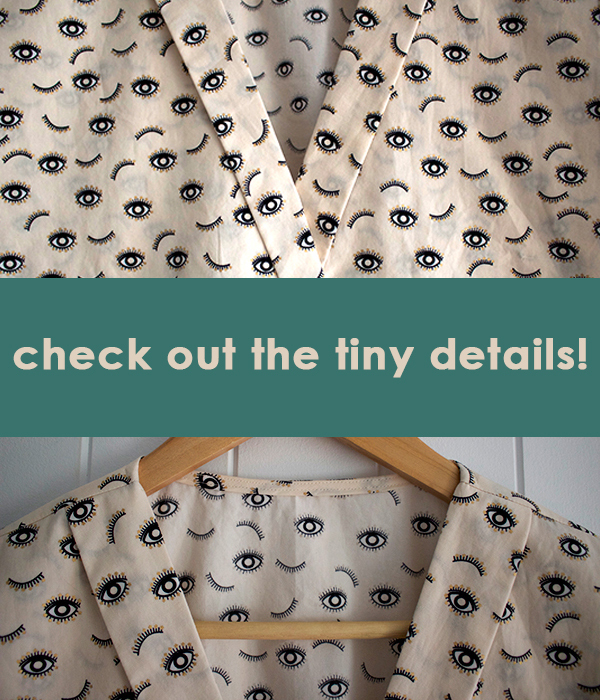 I’ve been “eyeing” this pattern (I know hard to resist those eye puns :)) ) since it was released – I love a lot about it – the V neckline, the faux wrap, and that fact Deer & Doe created it. But what I love the best about your top honestly is the fabric! Love those gold eyelashes! Beautiful. Lashings of praise for your Hoya- so glad you didn’t keep the lid on it! We all love a quick make- can’t beat knocking out a new outfit in the blink of an eye. This is a good ‘un, without a shadow of a doubt, but that’s just my view. Hello! 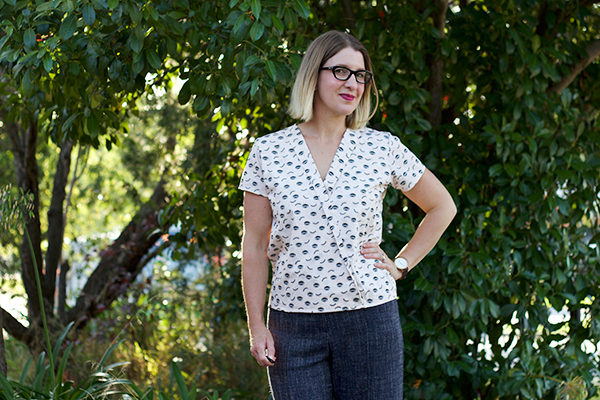 The pants are from Veronika Maine – there were some still in the Canberra store last week so they are still around 😀 The pattern is fab and I’ll be tracing it off! Your top is great and super love your pants !!! FWIW I don’t have an Officeworks nearby so for me to use an independent printer they charge >$9 per AO page. This is great, has a chic vintage vibe – I hadn’t really had my boat floated by this pattern until now. As always I like the cut of your jib Madame! Ooh you do this pattern really well, Amanda! The style of it really suits – love it paired with the wide leg pants. Super classy. IRON FIST has been SO disappointing!! Looks great. What are your pants? Also look super chic. Very cute! Looks so nice and crisp and especially digging it with those pants. It’s amazing, I love those eyes!! I wasn’t immediately taken with this pattern but it’s definitely growing on me. Loving it! Especially paired with those awesome wide legged pants. Perfect silhouette. I LOVE this!! Such a great print on a fantastic blouse! Now I really want this pattern! Very versatile – love that print too! Ahhh that print is what dreams are made of! Very nice. Good review, you mentioned everything, the good with the bad. I have made this T, in a solid, and embroidered it. A few alterations for my body, as I am an apple, but love the T!